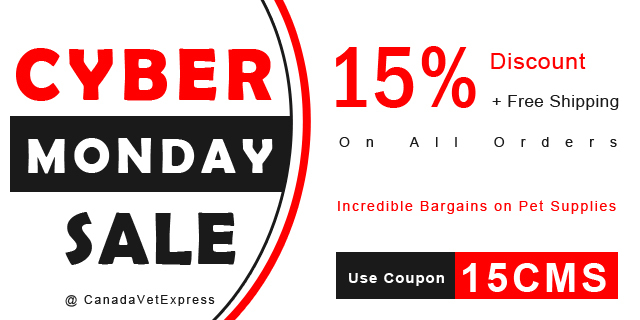 Cyber Monday Discounts- Buy More To Save More at Canada Vet Express! Did you all catch up with our Thanksgiving Day sale? If not, we are here with another discount offer just for you! Cyber Monday is the Monday following Thanksgiving Day and is a formal discount day for online retailers. To extend the opportunity of providing discounted pet supplies, Canada Vet Express is offering a discount of 15% on each and every product. Canada Vet Express is a trusted online store for branded pet supplies. We introduced ourselves almost a year ago and have become a relied source of pet care products for many pet parents of the country. There are two factors that have worked with us and led us to the hearts of pet owners which are: affordable pet parenting options and quality products. We provide trusted brands of flea & tick, eye & ear, wormers, heart wormers, dental wellness, and wound care products at the most competitive rates. CVE has a strategy which helps us to provide affordable pet parenting. This includes offering big, trustable brands at cheaper rates, free shipping, and customer satisfaction guarantee. To conclude, Cyber Monday has a lot in store for all pet owners. It is a genuine chance to try out long awaited expensive brands at lower rates and also to stock on your favorite supplies. Board along with Canada Vet Express to make your pet parenting safe, secure and affordable! NEXT POST Next post: Why Is Daily Exercise Crucial For Your Dog’s Good Health?